What is Paytm Wallet? How to use Paytm wallet from? Paytm whose full name is "Pay through Mobile". (Did you know this?) Is an Indian Electronic Payment Company. Founder of Paytm is Mr. "Vijay Shekhar Sharma". Paytm was Launched as an Online Mobile Recharge Website by its parent company (owner) "One97 Communication Limited" in August 2010. But today, Paytm has become a Payment Bank.The Paytm Wallet facility is also provided by Paytm. Through which you can do tasks like Online Recharge, Bill Payments, Ticket Booking, sitting in the house sitting in minutes. The best medium of digitizing Payment is becoming a Paytm Mobile Wallet. Those who have Smartphones, they will be familiar with Paytm Mobile Wallet. And will be using Paytm. 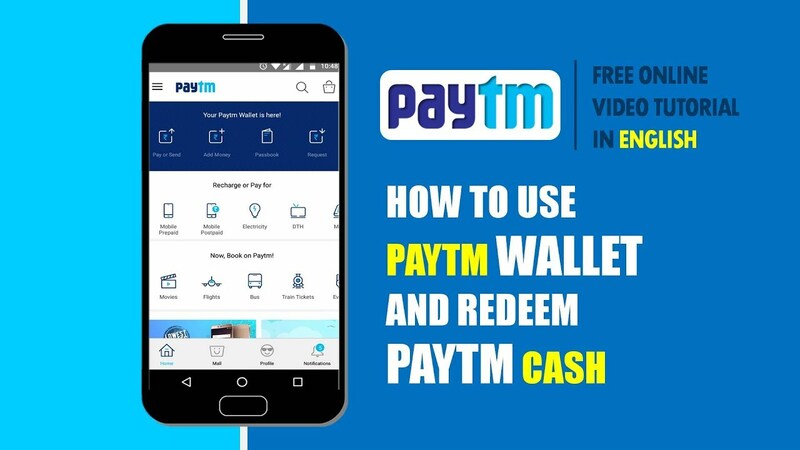 If you also have smartphones And now you have not used Paytm Wallet, then after reading this lesson, start using Paytm Mobile Wallet, and pay the same as Paytm Mobile Wallet. And Make Your Life Cashless. But, what is the Paytm Mobile Wallet? Will you have the same question in your mind? So, let us silence this curiosity and tell you what are these Paytm Mobile Wallet? Friends, in simple words, Paytm Wallet, also called E-wallets, is an App. This app works like our wallet. Simply, the difference is that money is physically kept in the wallet. And Money in Paytm Mobile Wallet remains Digitally Save. We can easily use this Mobile Wallet to pay for the work of Shopper, Milk, Electricity Bill, Mobile Recharge etc. Paytm Mobile Wallet keeps us free of cash. Paytm is available for almost every Mobile Platform (Operating System). You can download and install Paytm Wallet from Google Play Store for Android Phone. If you use any other Mobile Platform, This mobile Wallet is also available to them. You can download Paytm Wallet from Windows Store for Windows Phone. And for iPhones you can download Mobile Wallet from iTune. Friends, To make Paytm your wallet, you have to create a Paytm account first. If you google about creating a Paytm account, you will find dozens of tutorials. But, those tutorials have been made on the computer. So these tutorials become useless for people like you. Because you have to use Paytm on your mobile phone only. So we have prepared this tutorial only on Mobile Phone. If you follow the steps given below, you will easily create a Paytm Account on your mobile phone. You can use Paytm Wallet to pay for more than a dozen services. We have explained below some of the general usage of Paytm in detail. Through Paytm you can get payments from your friends, customers. And you can also send money to your friends. Apart from this, you can also pay for online taxi services such as Uber, Meru, Jugnoo etc. You can recharge your prepaid mobile online through Paytm Mobile Wallet. And you can also pay Bills of Postpaid Mobile like Airtel, BSNL, Reliance, Tata, MTS, Vodafone, Ides. Apart from this, you can repay the DTH Recharge, electricity bill, gas bill, water bill through Paytm also. By Paytm you can book online booking of Flight Ticket, Train Ticket, Bus Ticket. And the ticket of your favorite movies can also be booked by Paytm. You can easily shop online for yourself via Paytm. You can do Top Selling Products at Shopping Paytm. Users are also given huge discounts on Paytm. With Paytm you can send money from your Paytm Wallet to all the major banks in your bank account. And you can easily transfer money to your friends' bank accounts too.